1. Preheat the oven to 220˚C, gas mark 7. Put the meatball ingredients in a food processor, season and blitz until combined. Using wet hands to stop the mixture sticking, shape into walnut-sized balls. the meatballs over halfway through. 3. Stir the balsamic vinegar and sugar into the chopped tomatoes, season, then pour over the lightly browned meatballs. Return to the oven for 25 minutes, stirring halfway through. 4. Just before the meatballs are ready, cook the pasta according to pack instructions. To serve, divide the tagliatelle between plates and spoon over the meatballs and sauce. 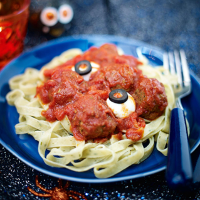 To give the dish a ghoulish appearance, sit the mozzarella cherries among the meatballs. Put thin slices of black olive onto each ball to make them look like eyeballs, then finish off by using the tip of a knife or a cocktail stick dipped into the tomato sauce to draw on lines to make the eyeballs look bloodshot. Per serving (4). More info: 45.6g protein, 4g fibre.